The lateral plantar nerve innervates all of the intrinsic muscles in the sole with the exception of the muscles below, which are supplied by medial plantar nerve. So that makes it a crucial motor nerve in the foot. • It likewise stimulates the adjacent plantar sides of the lateral one and one-half digit as well as a stripe of skin on the lateral aspect of the anterior two-thirds of the sole. 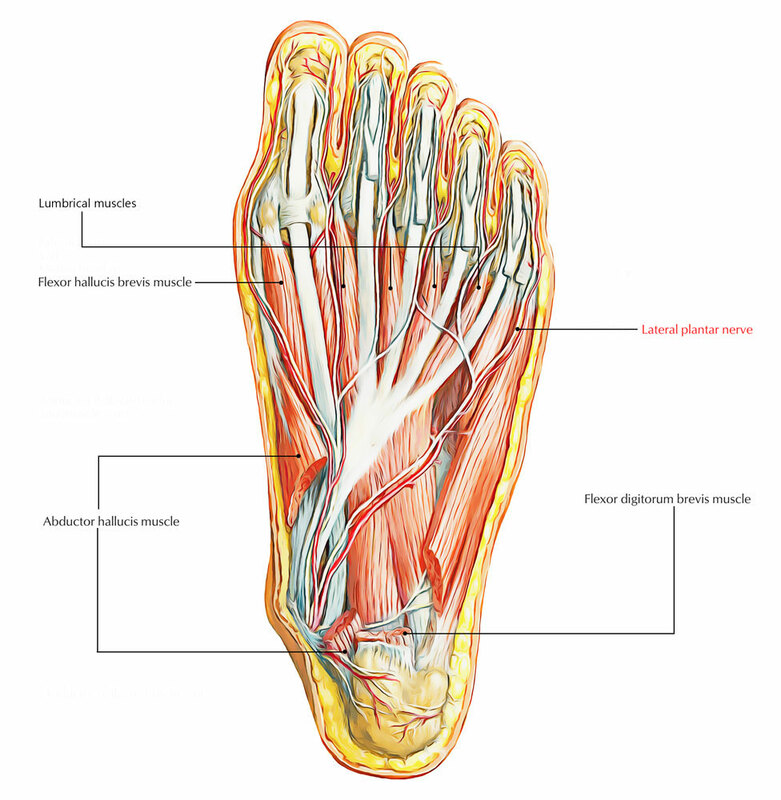 • The lateral plantar nerve goes into the sole of the foot through moving deep to the proximal connection of the abductor hallucis muscle. • It proceeds laterally as well as anteriorly through the sole in between the flexor digitorum brevis and also quadratus plantae muscles, giving branches to both of these muscles, and afterwards splits close to the head of metatarsal V in deep as well as superficial branches. • The superficial section of the lateral plantar nerve spawns a proper plantar digital nerve that splits to supply proper plantar digital nerves to skin on the surrounding sides of toes IV and V, which innervates skin on the lateral part of the little toe, as well as to a common plantar digital nerve. • The proper plantar digital nerve to the lateral part of the little toe likewise supplies the flexor digiti minimi brevis as well as the dorsal and also plantar interossei muscles in between metatarsals IV and V.
• The deep section of the lateral plantar nerve is motor and also goes along with the lateral plantar artery deep to the long flexor tendons as well as the adductor hallucis muscle. It gives sections to the second to fourth lumbrical muscles, the adductor hallucis muscle, as well as all interossei with the exception of those between metatarsals IV and V, which are supplied by the superficial branch.